CAERPHILLY council have given the go-ahead for an English medium school in Waterloo, Machen. At a meeting of the cabinet on Tuesday, it was decided to go ahead with the original plans, as opposed to proposals put forward by Plaid Cymru for a Welsh school at the site. In July, Plaid Cymru suffered a blow when Independent and Labour councillors voted together supporting a motion to get an English school built at the old Cray Valley Product site. Councillors voted for a motion to refer the matter back to cabinet to reconsider their decision and revert back to the original plan of establishing an English medium school at the site. At a full council meeting, the motion went through with 37 votes for and 33 against. The original proposal for the English school came from the previous Labour administration, but alternative plans were put forward after Plaid Cymru took control of the council in May. A special meeting was held in May when councillors discussed the form the school would take and the possibility of transferring Rudry school to the site. It is hoped the new school will be up and running by September 2010 and Rudry will be closed and the pupils moved to Waterloo. Leader of council Lindsay Whittle said everything was done to try and save Rudry school, but the wishes of the full council were respected. "We will now strive to improve conditions at Rudry Primary over the next few years as the Waterloo development proceeds to ensure pupils receive the highest level of education possible," he said. A report will now be prepared looking at the process for developing the school. I've been following the Rudry story for some time, so I'd like to give you some background information about what has been going on. This little corner of SE Caerphilly is in many ways quite unique. 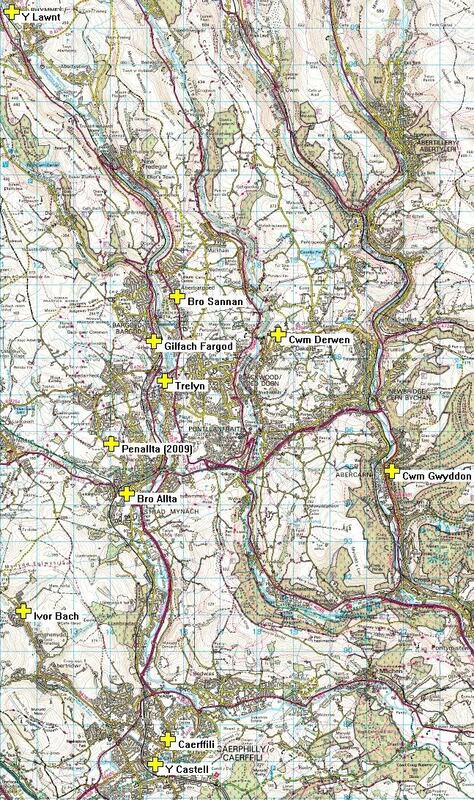 There are two distinct communities: to the north there is a fairly typical Valleys pattern, a linear settlement of small industrial towns/villages running along the Rhymney Valley. In this case the main settlements, from east to west, are Machen, Trethomas and Bedwas, and then the outskirts of Caerphilly itself. However to the south of this there is a much more dispersed, rural area comprised of small villages centred loosely around Rudry. The school for this rural area (officially given the Welsh spelling, Rhydri) is just at the junction closest to the Y of Rudry on the map. It is by all accounts a very good school, but overcrowded. It has 99 pupils, but a nominal capacity of only 74. Fairly obviously something must be done to correct this. 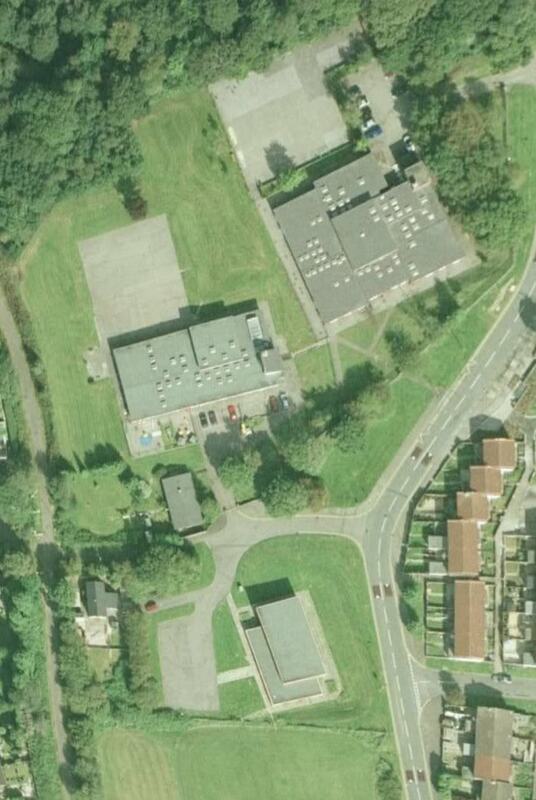 The next nearest school is Graig y Rhacca, some 2 km north, between "new" Trethomas and the Griag y Rhacca estate. In marked contrast, this school has a huge number of empty spaces. Only 149 pupils in a building with a nominal capacity of 270. 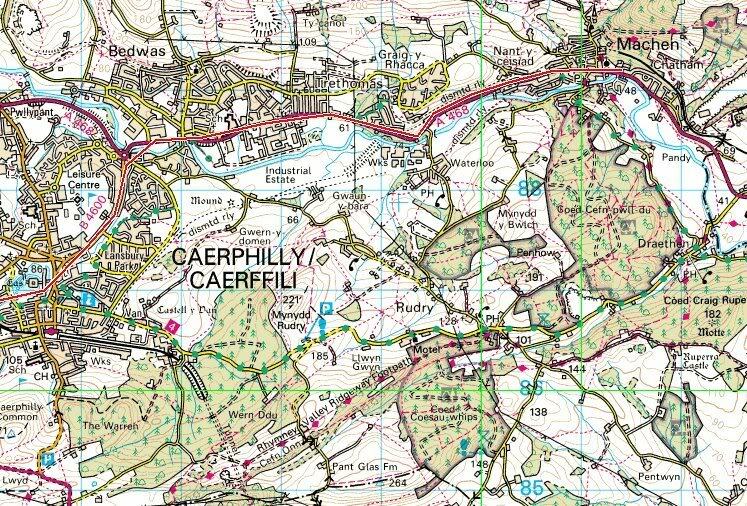 Now, one might reasonably ask, what would be so wrong about simply redrawing the catchment area so that the kids nearest the north boundary of Rhydri's catchment area went to Graig y Rhacca instead? The answer is simple, the Graig y Rhacca estate is, without wanting to offend anyone who lives there, hardly the nicest place to live, and the parents of the more rural south would fight to the death before sending their kids there. The new factor in the situation was the closure of the Cray Valley chemicals/paint site a few years ago (Wks on the map, just west of Waterloo). This site has been earmarked for housing and the idea was to build a new, larger school there to rehouse those at Rhydri and take the children from the new development. I'm not quite sure exactly how many houses would be built, but one figure I heard was 400, which would mean a population of about 1000, of which 10% would be of primary school age. So very roughly speaking there would be 100 new children to cater for in addition to the 99 currently at Rhydri. Hence the plan to build a new school. But it should be noted that the numbers (149 in GyRh, 100 new and 99 in Rhydry) would still roughly fit into the nominal capacity of GyRh and Rhydri, which is 345. Therefore the driving factor in the decision to build a new school is not numbers, it is the unpopularity of Graig y Rhacca. So far I've dealt simply with pupils as pupils, and not considered whether the preference of their parents is for Welsh or English-medium education. It is fair to say that Caerphilly as a county has a fairly good number of WM schools compared with neighbouring authorities, but it has none in this SE corner of the county. Anybody who wants a WM education has to travel over to the west side of Caerphilly to Ysgol y Castell. To give you an idea of the journey, a child from Machen would travel up the valley and go past or close to all these EM schools on their daily journey to Ysgol y Castell. Very clearly there needs to be a Welsh-medium school somewhere along this route. But I don't want to be dogmatic about which one it is. However the new school would be only some 500m from Graig y Rhacca, and it seems silly to be building a new EM school so close to another EM school. The children from the new estate could very easily go to Graig y Rhacca, where there are more than enough surplus places. But, that is clearly not what the parents of children at Rhydri wanted, nor what the staff wanted. And that's fair enough, for the reasons I've explained. But that brings me to the subtitle of this thread. The new school at Waterloo will be bright shiny and new. That's a huge plus. But, because it is right at the north of the current school's catchment area, it will involve an extra 1.5km journey for most of the pupils. Also, sharing the school with the new estate is going to radically alter the make-up of the school. Instead of reflecting the rural character of its catchment area, it will now be 50/50. I wonder if, having refused point blank to contemplate sending some of their kids to share a school with kids from the Graig y Rhacca estate, they will not have equal cause to regret doing exactly the same with an estate of about the same size only 500m to the south. But it's their choice, and they've got what they wanted. As a supporter of Welsh-medium education for every parent who wants it for their children, what I would say is this. I am not so fussed about which school buildings are WM and which are EM. A building is a building. WM education in SE Wales has in the main expanded because of the closure of EM schools, either due to demographic decline or because new EM schools have been built elsewhere. In another thread I listed six new WM schools that are opening this week. Four of them are in buildings "left over" in this way. It seems fairly clear to me that the old Rhydri school building will now be a very good location for a new WM school. Although the building is old, it is still serviceable. The big problem it had was overcrowding. With an intake of only ten or so pupils a year, it will be a perfectly viable WM school. It will attract new parents in this "rural" area who want WM education but weren't prepared to travel to Caerphilly to get it, and to those who don't so much mind if their kids are taught in English or Welsh, but prefer a small school more closely linked to their community. But of course this still leaves the question of a new WM school somewhere on the Machen/Trethomas/Bedwas corridor. It strikes me that Graig y Rhacca is hopelessly underused as an EM school, so why not take all that surplus capacity and use it to house a starter WM stream now? In the couple of years it will take to build the new school Caerphilly can do a proper survey of parental wishes and, if the numbers in the Machen/Trethomas/Bedwas corridor justify it (as I think they will), it can become another WM school. A brand new start would transform it. Turning to politics, the decision to build a new EM school has created yet more surplus capacity in the EM sector when the clear pattern of parental choice in an overall context is for more WM schools. That's why the political decision to build a new EM instead of WM school is hard to justify, even though easy to explain. But never mind, it simply means reshuffling the cards. We now have a way of getting two WM schools whereas before it would only have been one. Sometimes, when you don't get what you ask for, you end up with something more. LyndonApGwynfryn, 6 Sep 2007, wrote: Rhydri would be no good for a WM school, it's too inaccessible. The obvious solution would be to close Graig y Rhacca and move the kids to the new Waterloo school, freeing up the site for a new WM school. This plan has the added benefit of being bloody hilarious. Talk about a pyrrhic victory fot the Rhydri parents. MH, 7 Sep 2008, wrote: I don't think the current Rhydri school site is so very inaccessible, Lyndon. After all it is currently overcrowded, simply because its has a geographically large, though sparsely populated, catchment area. Back in 2006, 12.4% of Caerphilly's primary school age pupils went to WM schools, but the percentage is growing all the time. The opening of Ysgol Cwm Derwen on the old Rhiw Syr Dafydd site last week shows that. If we take neighbouring Cardiff as an example, we know they are planning for an annual growth of 5-8% and to reach 20% in WM education by 2010. We already have a situation where children in and around Rudry are travelling to Ysgol Y Castell, maybe some 15 or 20 children. On top of that there will be a similar number that would send their children to a WM school if one were available locally. And on top of that there will be parents who will prefer to send their children to the most local school, irrespective of language. That probably adds up to 50 children, which is a viable number for a school with a capacity of 74. However, it's pointless speculating when it should be possible for Caerphilly to do the same sort of detailed survey as Swansea have recently done. It will be two years before the new school at Waterloo opens, which gives everybody plenty of time to plan. If the numbers stack up, fine; if not, then it won't and shouldn't happen. But the building will still be there and hardly be much use for anything else, so why let it go to waste? When Ysgol y Ffin opened in a similarly "left over" building in Sudbrook it started with only 11 pupils. And, if it continues to be a school, it will double as a community resource ... as most rural schools do. The new school at Waterloo will not actually be in Rudry. The situation in the Machen/Trethomas/Bedwas corridor is different. I think we both agree that, following this decision to build a new EM school at Waterloo, the future of Graig y Rhacca in its present form must now be in the balance. The new school is going to have a capacity of 210, and it might not be possible to make it bigger for financial reasons. Therefore closing Graig y Rhacca school is going to be contentious. The capacity split would be roughly 115/155. This means that the current school numbers could fit quite comfortably into the Junior building, leaving the Infant building to become a WM school for Machen, Trethomas and the new housing development, with children from Bedwas having a choice of direction to travel. The school is in fairly spacious grounds, which means that there can be two sets of playgrounds and green space etc. There is nothing to stop this happening in time for September 2009. Nothing would have to close, and therefore no child would be inconvenienced. Anyway, moving on from then, things have taken a slightly different direction. The proposal now is to build a new Welsh-medium school as part of the redevelopment of the Bedwas Colliery site. On the map I posted before, it is just North East of Bedwas, marked by the old spoil heaps on the map. Here is the relevant document from Caerphilly's Cabinet meeting on 25 Nov 2008. In essence the idea is to develop this site in the same sort of way as the Cray Valley site, but this time include a WM school as part of the Section 106 agreement (the mechanism by which a developer agrees to either build or finance something of benefit to the community in order to get planning permission). There would be 630 new dwellings on the site. But there are some interesting figures in the report. At present 156 pupils in the Machen/Trethomas/Bedwas corridor are bussed into WM schools in Caerffili. So there is plenty of demand for a WM school in the area. In one sense the need is not desperately urgent. There are enough places in WM education for anyone who is prepared to travel to get it, and that travel is provided by the council (at a cost of £440 a day). But the places are filling up year on year, indicated by the fact that there are 341 children in the nursery in the three Caerffili basin schools, compared to 252 in Year 6. So, provided this new school is built within the next three or four years, there won't be an overcrowding crisis. But it will take time to go through the statutory processes. Of course it is right to try and get a developer to pay for a new school. Much of the school building stock is in poor condition, or just outdated. But who knows what effect the credit crunch will have on the development. These are not exactly the best times to rely on developers to build new houses or pay for new schools ... the whole thing could go pear-shaped. But one thing that won't change is the need for children to go to school ... or the need to respect parental choices about the language in which their children are taught. If we build new WM schools, we solve two problems at the same time. The demographic decline also helps. But if it turns out that we can't build new schools just yet because of the economic crisis then we have to look at converting schools which are currently EM to WM. Way back in 2003, Caerffili Council put forward plans which included building three new WM primary schools, one of which was at the old Penallta colliery site. The response was a lot of umming, arring and general grumpiness from the Welsh Government, but with a grudging concession that more WM was probably going to be needed. Roll on a few years and a new housing development gets built as part of the colliery redevelopment, and with it a new school as part of a Section 106 agreement ... but still with the same old umming and arring about what that school should be. The old Labour run council had not wanted it to be WM, but that was put on hold after they lost the local elections, and a yet another new consultation process then had to be started (yes, there's always a lot of red tape ... endless delay is the main tool used to prevent the expansion of WM education). The new consultation was in favour of it becoming a WM school by a majority of 11 to 1 ... and the existing EM schools round about had plenty of unfilled surplus spaces anyway. Even so, everyone still had to wait for Jane Hutt to make a decision. And, bless her, she got someone to write the necessary letter on her behalf at the end of last month. So this week Caerffili Council rubber stamped it. It was front page news in the local press, and the school is set to open in September this year. People can put up as many obstacles as they like but, in the end, it all comes down to the simple fact that more and more parents want their children to be educated in Welsh. The most the anti-Welsh minority can do is slow things down a bit. PS. Thanks to the Up the valleys ... blog for the tip off. Caerphilly Local Authority has established an additional two Welsh medium primary schools since 1996 (Ysgol Bro Sannan in 2004 and Ysgol Gymraeg Cwm Derwen in 2008). Both these two schools have attracted pupils and had more nursery pupils on roll in September 2008 than the admission numbers of the schools. It has become evident that the demand for Welsh medium education in the Borough is rising. Pupil numbers at Welsh medium primary schools have increased from 1719 in 1996/97 to 2109 in 2008, an increase of 23%, with further increases forecast in the next 5 years. At September 2007 nearly 13% of primary pupils in the unitary authority attended Welsh medium schools. In the Autumn of 2007 the Authority surveyed parents to seek their schooling preferences. To put this into perspective, it means that Caerffili will have to radically increase its current WM provision to meet the 27.2% demand from parents of children born in 2006/7 ... who will be starting school in the next few years. This is a map of where Caerffili currently has WM schools. Anyone care to suggest where these new schools should be? New Tredegar, Newbridge, Risca, Pontllanfraith and (as mentioned above) Bedwas/Trethomas seem to be obvious candidates. Basically the take home message from this is that BOTH Ysgol Gyfun Cwm Rhymni and Ysgol Gyfun Gwynllyw will be full in 2012. The figures also explicitly do not take into account the recent expansion of WM primary education in Caerphilly and Newport, and the expected third WM primary school in Torfaen. The accompanying comments from Newport councillors would seem to suggest that further investment in Torfaen will be unlikely, and that Newport will set up its own WM secondary school. This would probably take puplis from Ysgol y Ffin in Caldicot as well as Casnewydd and Ifor Hael schools. » What is the purpose of education?